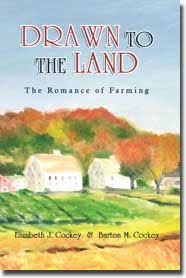 Drawn to the Land: The Romance of Farming by Elizabeth and Barton Cockey is a wonderful coffee table book with gorgeous watercolor paintings of upstate New York farms, coupled with personal stories about the area and modern-day accounts from farmers who are still working the land today. From cows and chickens to wine and maple syrup, the Cockeys present a beautiful account of farming in this area of the country. On a personal note, I enjoyed the memories this book evoked. I didn't grow up on a farm, but I did go to college in upstate New York. My school was further west than the area Elizabeth Cockey grew up in and described in Drawn to the Land. But I remember riding across the state of New York several times each year, looking out across the hills at the farms and small towns we passed through. It really is a beautiful country and the Cockeys have brought that beauty to life in Drawn to the Land. This review was written based on a copy of Drawn to the Land that I received from Phenix & Phenix Literary Publicists in exchange for an honest review.